Boy have I got a post for you. Get comfortable. When I first came to England, I was so excited to be in Europe where all these countries were so close together. It was a blow to realize Brits don’t actually go to other countries over the weekend just for fun. It was another blow to realize why when I got so caught up in schoolwork. In fact, I’m busier now than I ever was in these past two years. Not only do I have classes, assignments, an ECP (aka dissertation, aka thesis) to work on, this blog, friends to keep up with, Writers’ Society to run, and an actual workout regime of some sort (didn’t see that one coming! ), but I’m also still writing outside of school like I’ve been doing for exactly six years now (give or take a few days). With all that going on, there’s no time to travel! I should just get a picture of a beach at the poster fair and hang it in my room, just to pretend I’m elsewhere while I work. So that’s exactly what I did. My pin board has this enormous beach poster on it now. Sometimes I turn on all the lights in my room, put my sunglasses on, sip a drink through a straw, and pretend it’s not raining outside. Okay, I’m lying. As it turns out, you can do amazing things if you just close your eyes and click buttons on your laptop. That’s kind of how this blog came to be. That’s how I got here, to Paris. You can read this nonsense and decide for yourself whether I’m lying to you or not. I’ve been told I’m good at lying. Ages and ages ago before this blog even existed, I thought, hey, I’m going to be really close to so many countries over the next three years. It would be cool if I could visit some of them. Would I be willing to go to a foreign country alone? This was before I went to England alone, in case you were wondering. As for the question, I thought about it. I’ve been thinking about it ever since I first asked it, wondering whether I was brave enough, or charismatic enough, or fluent enough to ever do what I was thinking about doing. Sure, I could go to England where they speak English and the biggest culture shock was rain. Going somewhere with different ways of greeting people, a different language, and different everything else was a whole other thing—a thing I wasn’t sure I’d be able to tackle. Before today, trips outside of Winchester meant Southampton, London, or that one trip to Paris in May. Always with friends, except for a few trips to Southampton, which hardly count because all I did was go to the shopping mall and have an ice cream float. Paris was fun, as you can read if you click here. I knew I wanted to go back one day. It was a good start to this whole idea, because although I’m not even close to fluent in french, I’ve got some background and it’s enough to get by most of the time. Before I left for school this year, my mom asked what I wanted for my birthday. I don’t really celebrate my birthday. I’ve had some pretty bad birthdays in the past and nowadays I find that my favourite birthdays are spent chilling with popcorn and Netflix, or writing a crazy three thousand words in a day (crazy for me, I mean), or going to an acting lesson with my siblings where we can goof off…all those days with triumphs and contentment that make you really love being alive, you know? When I came to uni, I was starting a new chapter. Not only did I not know anyone in England, but they didn’t know me, and I intended to use that to my advantage. I do my best to avoid telling new friends when my birthday is, and I don’t remind old friends. I try not to, anyway. Last year, some of my friends at uni got ahold of a date really close to my birthday and we went to London on that weekend. They gave me a gift and treated me to dinner on the wrong day and everything. It was kind of great. So I thought, why don’t I celebrate my birthday this year? My friends don’t have to know I celebrated it, I’ll just do it. So when my mom asked about my birthday, that’s when I started to dream up ways of celebrating. The most outrageous thing on my list was to run away for a random weekend in the middle of the semester. Of course I did the most outrageous thing on the list. I was actually sitting with the friends who took me to London last year when I booked the trip. I thought I’d just do some research, but then I paid for tickets and a place to stay and even threw in a few other things. No one noticed. Considering I love to talk about myself (hence the blog), I’m pretty proud of myself for keeping this quiet for so long. Dodging questions about this weekend felt like dodging bullets like in the Matrix. Most of the time I could get away with making a face and saying, “Sorry, I’m busy.” Sometimes they’d ask, “Busy doing what?” and then I’d have to make another face and say, “A lot of things. You have no idea.” That was usually enough. The first question, however, required outright lying. There were two people in the entire world who knew where I was running away. One was the man who offered me a job nearly two weeks ago. We talked for six hours that one time. A lot comes up in six hours. The other was the woman at the bank who hooked me up with some Euros. I don’t think she told anyone. Yesterday I had class at 9, then my first day of work after class, then a tae kwon do lesson, then I had to pack. I went to sleep at 1-ish but kept waking up every half-hour or so. Eventually, at 3:30am, I gave up trying to sleep. It wasn’t even an excited kind of can’t sleep, it was more like a I’m-scared-I’m-going-to-miss-something kind of can’t sleep. The trains don’t run at certain times of night, so at 4:30 this morning, I took a cab to Southampton Airport.I waited for the check-in to open, went through security, and had a good sit-down breakfast of eggs benedict (not the best) and still had an hour to spare. I slept on the entire flight, except for a little while fifteen minutes in when we had horrible turbulence. It felt like we were falling ten feet at a time, but it was over quickly. Turbulence happens to be my favourite part of plane rides anyway. I arrived at Orly Airport at 8 or 9 (I was too tired to check my watch), took a bus, took the metro, and walked until I found my hostel. I had every intention of putting my stuff away and going to sleep as soon as I was on my bed, but was then told to come back between 3pm and 1am for my key because the room wasn’t ready yet. So, sleepy-eyed as I was, I went off to conquer the city! My first stop was at a tech store to buy an adapter. Anti-climactic, isn’t it? The store was horrible. It’s under construction, so all the signs that say where things are supposed to be are actually pointing at nothing and the whole thing is a maze. I went from employee to employee for maybe an hour before someone finally told me the adapters were downstairs. I didn’t even know there was a downstairs! I did a lap of the downstairs floor and found it pretty easily, and then I went back up to check out, only to find out that the cash registers were on the floor below the downstairs floor, which I didn’t know existed, either! I finally got out and found myself in a shopping mall. Not just a shopping mall, but I recognized it as one I’d been to in May. I didn’t get much, just some soap at Sephora. After that I just walked for a bit. I didn’t really have a place in mind to go, so I can’t really say I got lost. I walked wherever I wanted, and came across this restaurant that advertised “Sunday brunch all week” which sounded good to me, so I went in and ate there. Do you ever try something new and it takes you a minute to figure out how to eat it so that it tastes good, and then the waitstaff give you strange looks and you know you’re probably doing something wrong but you don’t care? No? Nevermind. While there, some girls with Forever 21 bags came in so I knew there was one nearby. When I continued on my walk afterwards, I found it. It was one I’d been to before, back in May. 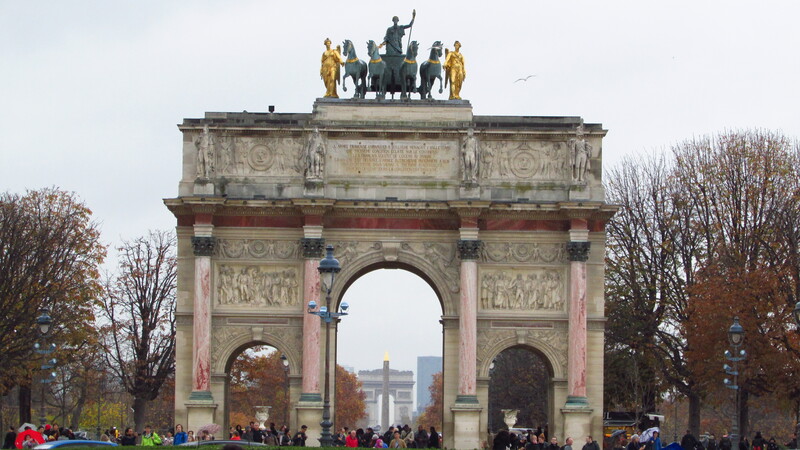 It was really close to the Louvre Museum. It had been really hot and sunny when I left the hostel, so I left my jacket, but by the time I arrived in Forever 21, it was starting to rain. Because the store was warm and dry, I looked around a bit. I’d like to think I only got what I needed, but that’s not exactly true. 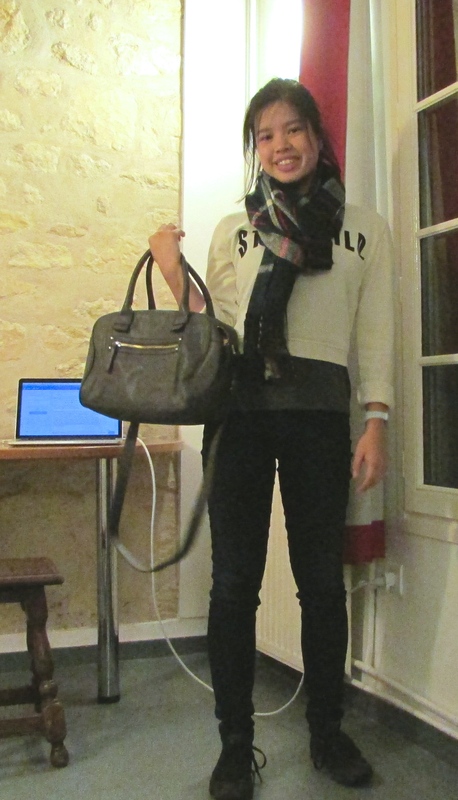 First, I got a shoulder bag with zippers, big enough to carry my laptop and notebook. It kind of looks like a bowling bag, but also kind of not??? Anyway, I really like it and I already cut off the tag so there’s no going back. I also got a scarf, which I’m currently wearing. It was soft plaid and cheaper than most soft plaid scarves. Besides, it was cold out. I don’t need to justify myself to you. Lastly, I got a white cropped sweater that says “Stay Wild” which I just got to reward myself for doing exactly that by going on this spontaneous trip. 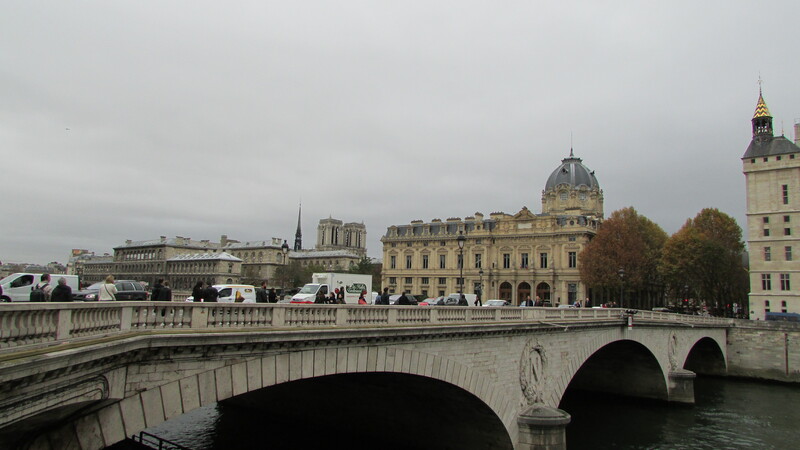 So I found myself close to the Louvre with no plans, and of course I headed over. There was another fancy building across from it with an art exhibit, so I took my time, looking at pictures of the pieces that were on the fence outside. I sat on a bench between the two buildings for a while, getting rained on and taking pics, then I finally went over to the Louvre. I forgot how huge it was. It’s huge. I didn’t go in, but I went around the courtyard, taking pictures and looking at stone butts through the windows. I looked down into each of the mini glass pyramids. I wonder if they put information desks under each one on purpose? Probably. 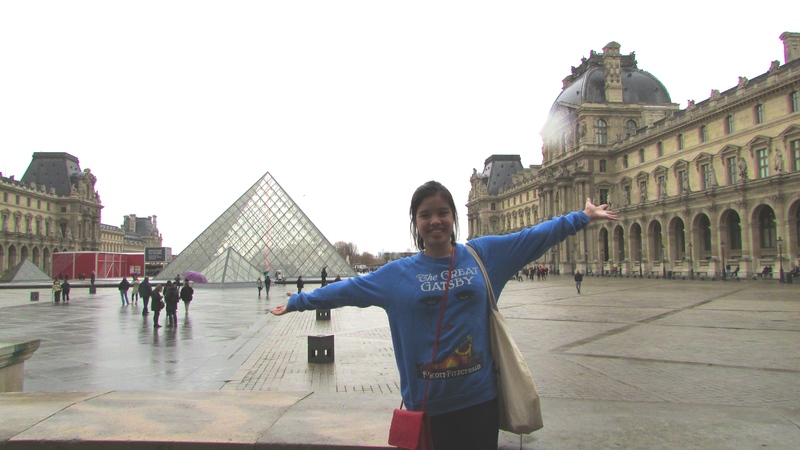 After I had my fun, I went and took a look around the Louvre Gift Shop. 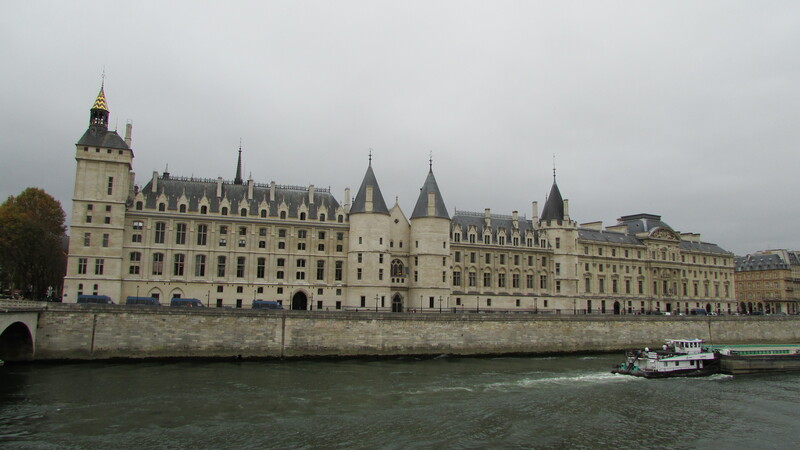 The thing about that place is that it has pictures and replicas of all sorts of art from the Louvre, and a few from other Paris museums, too! It was almost like being in the actual museum, but with poorer quality stuff than the originals and a lot of advertisements to get through. Omg. 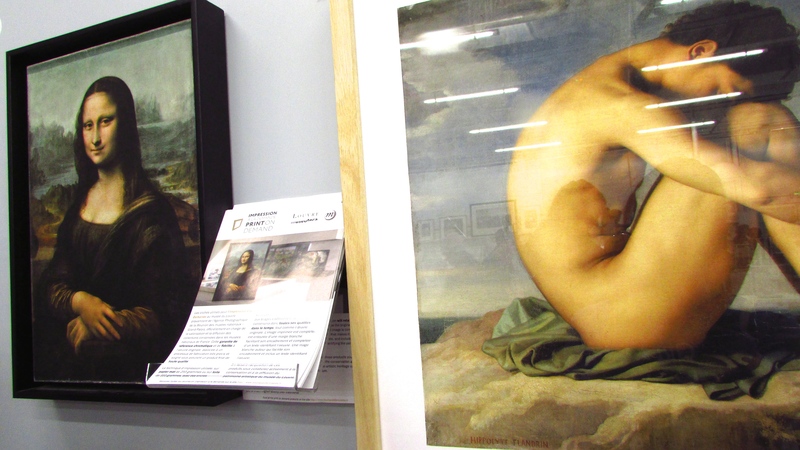 I illegally downloaded a museum…legally. I bought three picture cards (like postcards but you don’t send them off). “Young wife sits in front of an easel” by Jean-Baptiste-Camille Corot, “The victory of Samothrace,” a sculpture from 190 B.C., and “The church at Auvers” by Van Gogh. 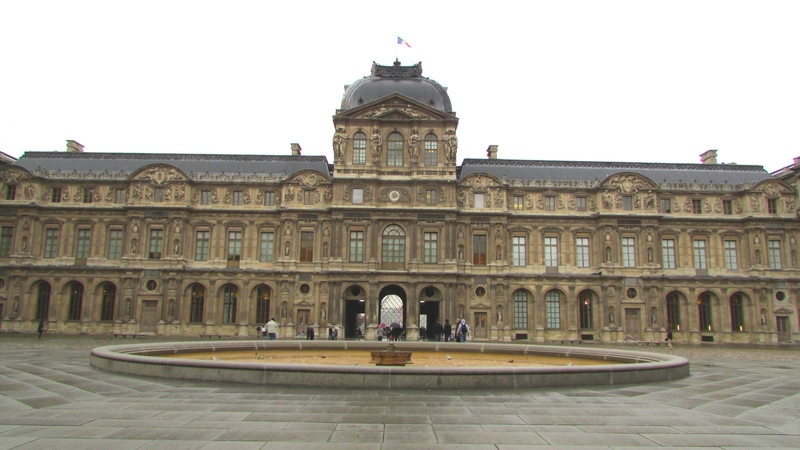 It was after I left the safety of the Louvre’s courtyard that I got lost. By now I was pretty wet because it had been raining the entire time. Not so badly that I accepted an umbrella from the shady vendors around the Louvre, but enough that I was annoyed. It actually turned out to be a pretty cool store with lots of different bits and bobs. They sold a lot of different earbuds (headphones, too, but I’m talking about earbuds) and the cheapest earbuds there were €100. I saw that and was like, hahahaha okay I’m out. I asked the guy at the door where the nearest metro station was and it turns out it was JUST AROUND THE CORNER WHERE I HAD BEEN TWO TIMES ALREADY IN THE LAST HALF-HOUR. I got back, got my key, settled in, and started writing. When I thought I might be lost. When I realized I could see Notre Dame and therefore knew exactly where I was. 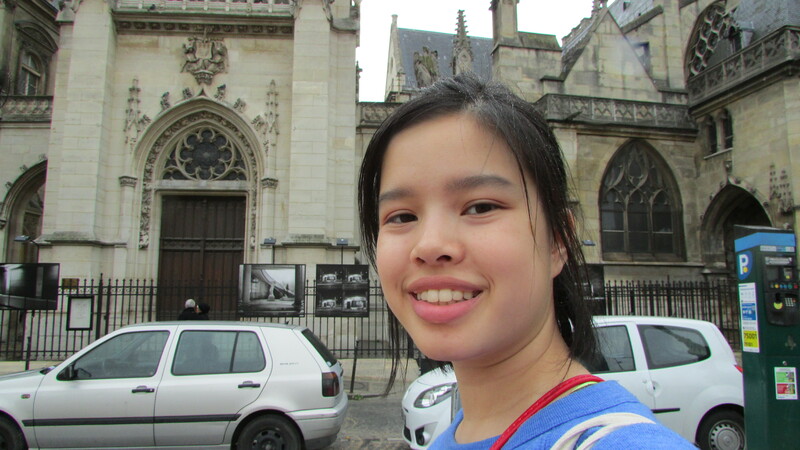 Selfie in front of the building in front of the Louvre. The courtyard of the Louvre Museum. 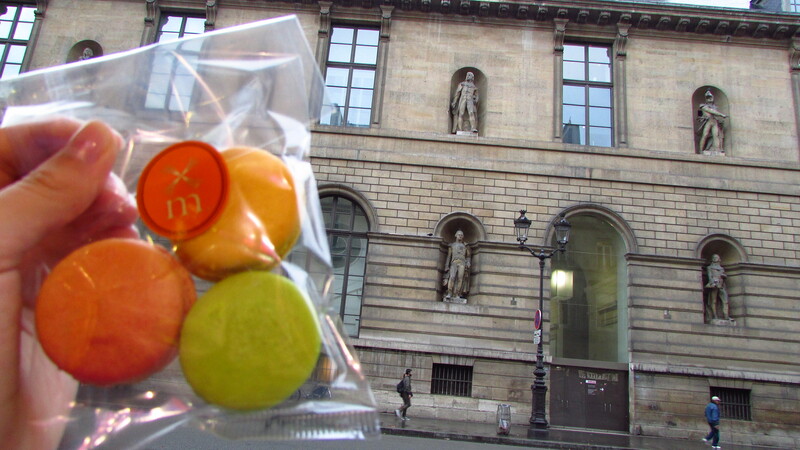 I got some macarons at some point. They’re gone now. I’m a bit of a mess, but you get the idea.